America's favorite cookie meets Halloween. What a perfect combination. 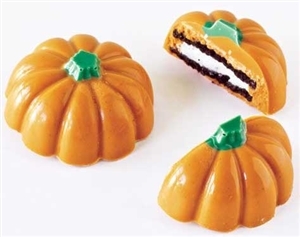 Our adorable hand dipped and hand decorated chocolate covered 3-D pumpkin shaped Oreo cookies come individually wrapped. Made only with white chocolate. This extra large pumpkin is 2.5". Use as a Halloween party favor or hand out to the kids in the neighborhood.